I did this walk on 19th March 2009, driving up from Walthamstow and parking at Coggeshall in the small public car park located off Stoneham Street. The day started bright and sunny however after only an hour or so the skies clouded over and it remained quite gloomy for the rest of the day. From the car park it was just under a miles walk back to the point where I had finished the previous stage of the Essex Way on the outskirts of the village. 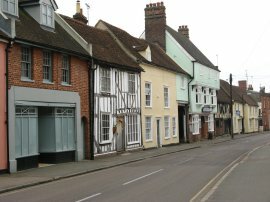 From the car park I headed across Market End and up Bridge Street where I crossed over the River Blackwater, photo 1, before continuing ahead into Grange Hill to reach the Essex Way. 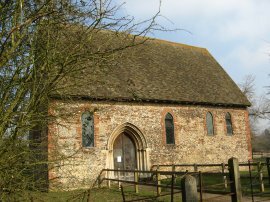 After I had made my way back to the point where I had finished last time I turned around and began retracing my steps towards Coggeshall, photo 2. 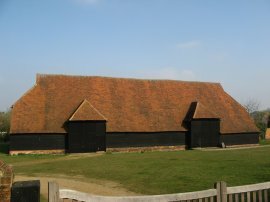 Just before the route crosses Grange Hill the path passes by Grange Barn, photo 3, another fine old timber barn built in the 13th century. The barn is now managed by the National Trust and houses a collection of farm carts and wagons, although it was not open when I was there. The route then heads across Grange Hill and continues down Abbey Lane. A short distance down this unsurfaced track the route passes the small chapel of St Nicholas, photo 4, which was built around 1220 and is one of the few remaining parts of the old Cistercian Abbey of Coggeshall. 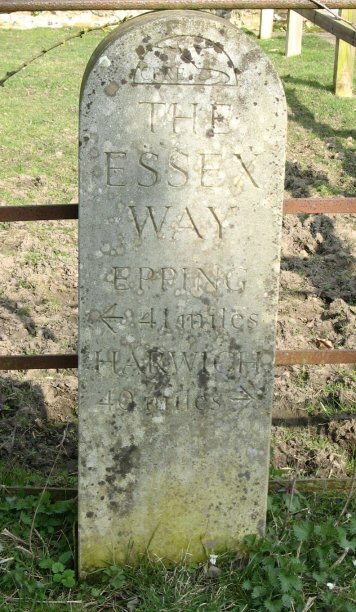 Just outside the church grounds was a concrete waymarker, photo 5, that showed I had now just passed the halfway point of the Essex Way, the marker stating it was 41 miles from Epping and just 40 to Harwich. A little further down the lane the route passes a private house that has been built around the remains of the old Abbey building and just beyond that passes Abbey Mill, photo 6. 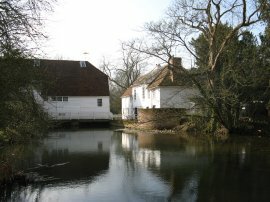 From the Mill the route crosses over the River Blackwater and turns to the left running alongside a couple of fields to reach East Street on the outskirts of Coggeshall. 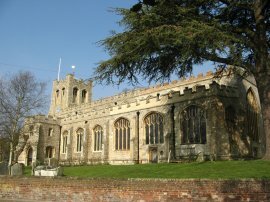 Here I turned to my left for a short distance along the road before taking a footpath off to the right that runs alongside the edge of a playing field and then a school to join Church Street opposite the impressive St. Peter-ad-Vincula Church, photo 7. Here I turned to my right and followed the road round to a small mini roundabout where the route heads to the right down Saint Peter's Road. 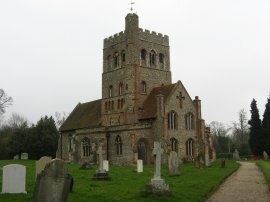 This was one of the few places that I have come across on the walk where there was not an Essex Way marker to point me in the right direction, (well not one I noticed anyway), and I had a brief stop to get my map out to check I was on the right route. Something I have very rarely had to do so far on the Essex Way. A short distance down Saint Peter's Road the route joins a footpath on the left that runs for a short distance besides a drainage ditch before heading out to cross over a couple of fields to reach the A120. The road had been quite busy when I had driven along it in the morning however my arrival coincided with a lull in the traffic and I was able to cross straight over without any wait. 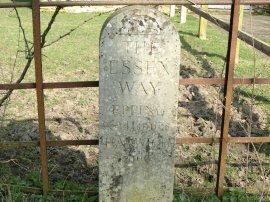 There then followed a stretch of path of just over three miles length where the route of the Essex Way makes its way alongside field edges towards the village of Great Tey. The path crosses over Houchins Lane, passes a couple of ponds hidden behind a raised embankment and bends round to briefly join East Gores Road before continuing ahead along side fields. For a while the path runs quite close to the A120 but fortunately the wind was blowing in the right direction to keep the traffic noise reasonably low. On the way I also passed a couple of extremely smelly heaps of manure besides the field edges that were really unpleasant to walk past and cast their aroma over a very wide area. Nearing Great Tey the route makes its way around a plantation of young trees, crosses over a concrete driveway and heads through a small section of low scrubby trees before coming out into a playing field close to the rather strangely constructed St Barnabus Church at Great Tey, photo 9. 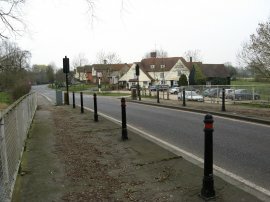 The Essex Way turns to the right along The Street and the left along Chappel Road. 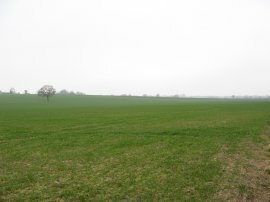 After a third of a mile the route takes footpath on the right that runs down besides houses to once again enter fields. 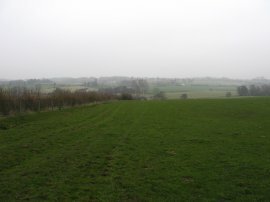 The route runs alongside the edge of two fields before turning to the left and joining a lane that heads down towards Pattocks Farm. Just before the farm is reached the Essex Way bears off to the right and then soon takes another footpath off to the right. This runs alongside the edge of a field, past an isolated house, down to join Bacon's Lane. 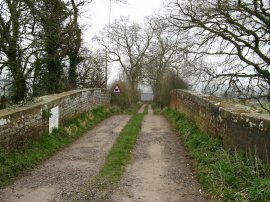 The route then continues ahead along Bacon's Lane, photo 10, crossing over a railway line to reach Bacons Farm. 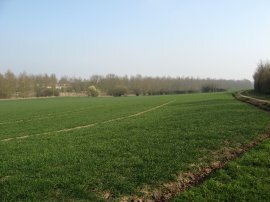 Here I followed the route through the farmyard, where I was joined for a while by a rather excitable dog, before taking a footpath that headed off to the left along the edge of a grassy field, photo 11, that gradually descended down to reach the River Colne, photo 12. 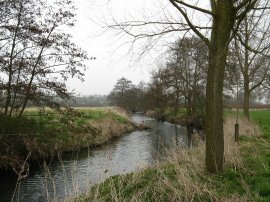 At the river the route turns to the right running alongside the banks of the river towards the village of Fordstreet. As I reached the river I had noticed a large group of ramblers approaching the river from the other side and a little while later, when I looked behind, I noticed that they had joined my route alongside the banks of the river. 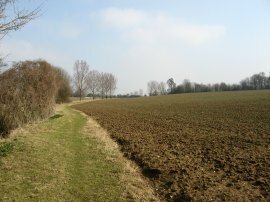 The Essex Way runs alongside a number of large wide open fields by the river, photo 13, before entering a narrower section of path that runs between the river and a very large nursery. The path then passes down the side of a house to join the road in Fordstreet. 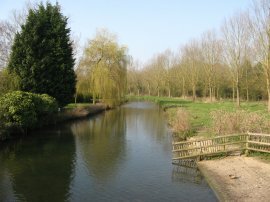 Here I turned to my left to walk the few yards down the road to the Fordstreet Bridge, which takes the road over the River Colne, where I finished this stage of my walk along the Essex Way, having walked exactly 8.4 miles further along the path. Crossing over the road I went and sat at one of the benches outside the Shoulder of Mutton pub to eat my lunch where I was soon joined by the group of ramblers I had seen earlier, somewhat disturbing the peace and quiet of the surroundings. Leaving Fordstreet I then retraced my steps back along the Essex Way for about 2 1/4 miles, along the River Colne and then up through Bacon's Farm to the lane by Pattock's Farm where I turned to my right, leaving the Essex Way, to start making a circular route back the rest of the way to Coggeshall. 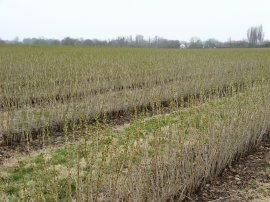 Much of the landscape was very similar to that I had passed through on the outward journey although I did pass through a farm where there were a considerable number of fields planted with what I think were blackcurrants, photo 15. Just like the previous stage, when I reached the car I had walked 16.7 miles altogether. 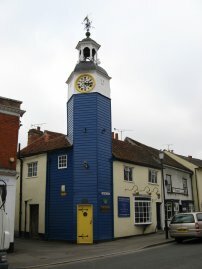 Coggeshall was an interesting village to look round with a wide variety of old buildings, photo 17, including the Victorian clock tower, photo 18, close to where I had parked. 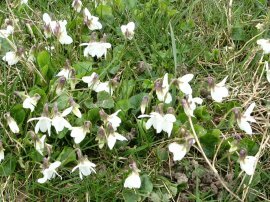 I had been a little bit apprehensive about doing this walk as after the previous Sunday walking along the Saxon Shore Way my feet had felt quite sore at the end of the day and I was unsure if they had fully recovered but fortunately they were fine on this walk.